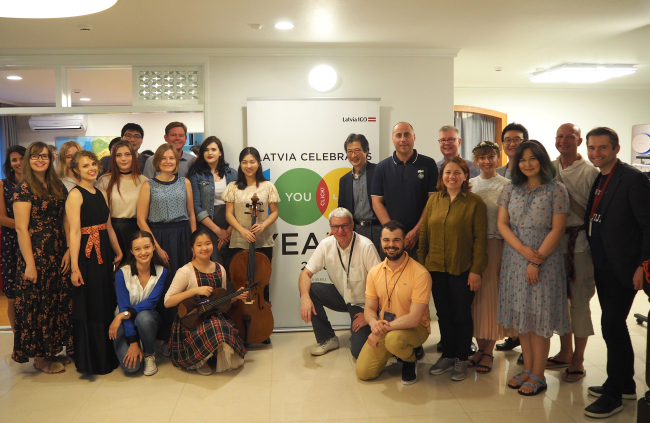 Participants, including Latvian Ambassador to Korea Peteris Vaivars (center) and Estonian Ambassador to Japan and Korea Jaak Lensment (back, sixth from right), pose at the Latvian Embassy in Seoul, which organized the midsummer celebration on June 19 on behalf of Baltic diplomatic missions in East Asia. Baltic countries Latvia, Estonia and Lithuania celebrate the Midsummer Day annually on June 23, when the sun is visible for the longest time. People decorate their homes with wild flowers and tree branches, and light up bonfires. They also sing songs, eat cheese and barbecued meat, and drink beer. At the embassy, young Korean musicians Bae Jin-yeon and Bae Seo-yeon played scores by Karlis Davidovs and Raimonds Pauls, respectively. Baltic foods and alcoholic beverages were served.